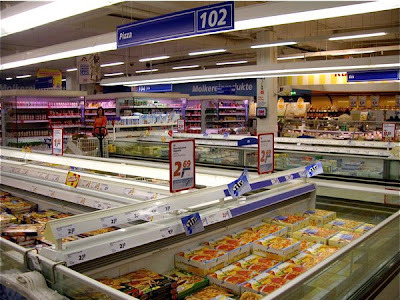 I love grocery shopping abroad. Looking for interesting products to bring home with you and prepare for your friends. In Schwerin I did my grocery shopping at Real Supermarket on the 3rd floor in Schlosspark centre. Here is what I placed in my trolley. 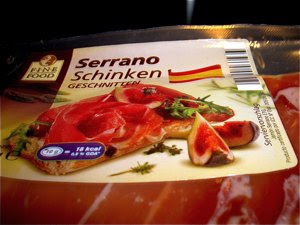 Very thinly sliced tasty and tender Spanish cured ham is always a winner. Good as contrast to sliced cantaloupe or served as it is, drizzled with a little olive oil. Dried vegetables for bruschetti with olive oil, garlic and peperoncini. 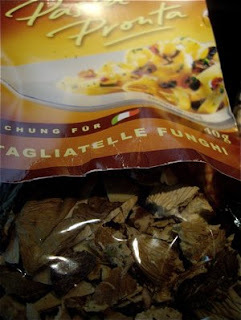 Italiens love dried products, as mushrooms and tomatoes. At Real I found three packages for three different purposes. This is a great product. Kattus has made a package containing dried vegetables to create your genuine Italian bruscetta. The only thing you have to do is to revive them with oil and water, then spread on hot bread. 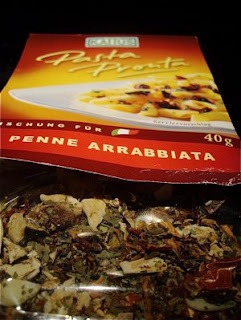 Alternatively it may be used in a risotto or a pasta dish. Dried ingredients for penne all'arrabbiata, a classic Roman pasta dish. Penne with tomatoes, garlic, basil and chili, a hot experience. Arrabbiata means angry - not a sauce for the fainthearted. Once again dried, ready to be used. Italians love their mushrooms, and they have a religious attitude to porcinis, morels, and the expensive truffles. One of the favourite ways to preserve them are dried. On every markets you'll find packages of different qualities of porcini mushrooms. 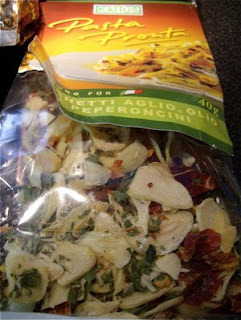 Kattus have once again dried vegetables for a classic pasta dish. 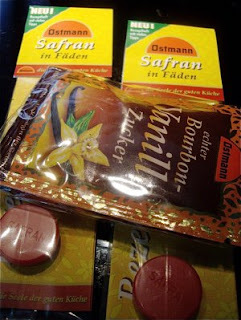 Ostmann Safran powder is a precious spice with a highly aromatic taste. Versatile ingredients used for fish, or crustaceas, meat, poultry, sauces or soup. The ingredient in a bouillabaisse, traditional paella or risotto. Tinned chicken breast in brine. Very interesting. I have never seen chicken preserved in this way. It will be interesting to see how it looks and tastes. How to use it? I have really no idea. In a mayonnaise based salad with curry? In a chicken pasta dish? It all boils down to the quality of the meat. Italian mortadella - light meat sausage with white fat and ingredients as coriander and pistachios, thinly sliced - what could be better? Here is one German variation - in a tin. 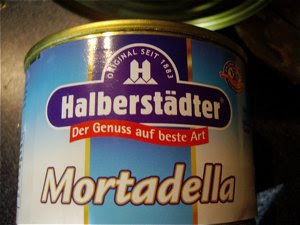 Germans loves their preserved meats. 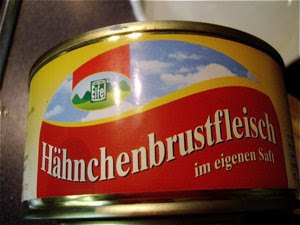 You get tins or glasses with regular sausages or other meat products as Jägerwurst or Leberwurst. Very tasty. We had a few varieties on our breakfast table. I am excited to see what comes out of the tin. I'll keep you posted.